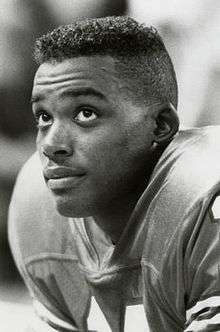 Andre Ware (born July 31, 1968) is an American sports analyst and commentator and a former American football player. He was the 1989 Heisman Trophy winner as a quarterback for the University of Houston. In the 1990 NFL Draft, Ware was the first round selection (#7 overall) of the Detroit Lions. He was inducted into the College Football Hall of Fame in 2004. Ware grew up in the Galveston, Texas region, hoping to play football at the University of Texas. He said "I was going to Texas. All they had to do was lie to me and tell me I was going to play quarterback once I got there. Thank goodness they told me the truth [that] they were going to move me to defense". After graduating from Dickinson High School, Ware instead played at the University of Houston, where he won the Heisman Trophy in 1989, along with the Davey O'Brien Award, the latter award given to the most outstanding college quarterback of the year. That year, his junior year, he threw for 4,699 yards, 44 touchdowns, and set 26 NCAA records. Many of the records were thanks to the innovative use of the Run & Shoot offense, which his successor, David Klingler, also used to great effect. The Cougars ended the season ranked the #14 team in the nation by the Associated Press. He then declared for the NFL Draft, foregoing his senior year. Ware joined the Lions for the 1990 season, teaming with the previous Heisman Trophy winner from 1988, Barry Sanders. Ware spent four years with Detroit, playing 14 games and starting six: then-coach Wayne Fontes insisted on starting the oft-injured Rodney Peete, and usually replacing Peete with Erik Kramer when Peete was hurt or played poorly. Fontes generally only played Ware when the Lions were out of the playoffs or already losing a game by a wide margin. Ware's best stretch came late in the 1992 season when the Lions were out of the playoffs: he won two of three games. He began 1994 on the roster of the Los Angeles Raiders, but was released after several games. In 1995 he was signed by the Jacksonville Jaguars, one of the NFL's two expansion teams that year. As a former Heisman Trophy winner, Ware's presence gathered much local excitement in Jacksonville, but ultimately, Ware was cut from the team the week before the regular season began. Ware also played in the Canadian Football League with the Ottawa Rough Riders, the BC Lions and the Toronto Argonauts (where he backed up fellow Heisman winner Doug Flutie), and five games with the Berlin Thunder, a German NFL Europe team. Ware is now part of the Houston Texans' radio broadcast team. He is teamed up with Marc Vandermeer and previously he was paired with Gary Thorne, for college football games on ESPN, ESPN2 and ESPN on ABC. In July 2009, ESPN announced that Ware will team up with long-time SEC broadcaster Dave Neal in the fall of 2009 as color commentator for ESPN Regional Television's coverage of Southeastern Conference Football. He also appears as a player in All-Pro Football 2K8. In 2004 he was inducted into the College Football Hall of Fame. On February 29, 2012, he was inducted into the Texas Sports Hall of Fame. Other members of his class include Texas A&M University Women's basketball Coach Gary Blair, Shawn Andaya, University of Texas Football Coach Mack Brown, Fred Couples, Coach Lovie Smith, G.A. Moore. Jr., Bubba Smith, Dave Parks, and Tobin Rote. ↑ Weissman, Steve (host); Ware, Andre; Schad, Joe (2014-04-21). College Football Live. ESPN.